John Kiely celebrated the biggest win of his long training career when Carliingford Lough finished with a wet sail to win under Barry Geraghty at 12/1. The Colin Tizzard-trained Cue Card, sent off 4/6 favourite, could finish only fourth after Carlingford Lough scored by four and a half lengths, with Djakadam in second. “I’ve been coming to Punchestown since 1948, when I was here as a child, and this is a never-again experience in my life. But once is lovely!” said Kiely. “I ride the horse out practically every day and I was very happy with him. He felt very good. He’s the best I’ve trained and the best I will train. “He travels well when he’s happy and relaxed and he stays really well. He’s an easy horse to train, you just have to keep him fresh. He came a bit late at Cheltenham and he didn’t seem to handle the ups and downs there. I think he prefers a level track and he’s probably better in Ireland. “It was unbelievable. It was easier today because he wasn’t fancied – nobody seemed to think much about him. We even contemplated whether or not we should be here. “Today was undoubtedly the highlight with him. I would have been delighted to have been placed. I thought we could beat the Irish horses and I would have been delighted to be placed. 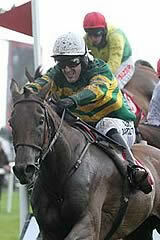 Barry Geraghty added: “What a trainer John Kiely is. The horse came from the clouds to win in Leopardstown when Mark (Walsh) gave him a brilliant ride. He couldn’t go the gallop at Cheltenham and couldn’t go the gallop today but really finished it out. “He picked up in the straight and it was a question of how long he could sustain that run. He went all the way to the line and was brilliant.